Un film di Neil Burns. Con Powers Boothe, Jay Brazeau, Brian Drummond, Ben Cotton, Aiden Drummond. 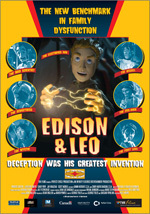 Titolo originale Edison and Leo. Animazione, durata 79 min. - Canada 2008.